Introducing the all-new Helsinki AirJet™. The future of hot tubs. This Nordic inspired spa features the new and unique Freeze Shield™ technology so you can now enjoy your hot tub all-year-round. From warm summer days to icy cold winter nights, the Helsinki AirJet’s innovative pump ensures you can experience true relaxation 365 days a year. This coupled with the ultra-strong Drop Stitch construction with realistic wooden design, sets a new standard in hot tubs and is totally unique from anything else on the market. Suitable for up to 7 adults, the Helsinki AirJet’s spacious surroundings can be enjoyed by you, your friends and your family. Including a cushioned insulated floor and generous seating area, you can really stretch out and relax. Freeze Shield™ technology is a brand new market leading development, unique to Lay-Z-Spa. 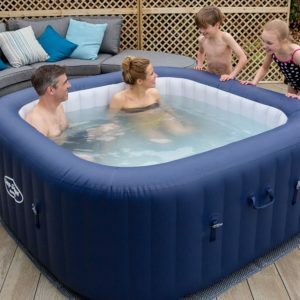 For the first time ever, inflatable hot tubs can be used all year-round; from the warm summer months to the coldest winter nights. Freeze Shield™ technology allows you to set the pump to run at a low temperature, in a power saving mode for long periods of time using minimal energy whilst ensuring that water temperature does not freeze (the pump must be powered at all times). Activate the 87 AirJet™ massage system and surround yourself in thousands of therapeutic bubbles in seconds. At the touch of a button the Helsinki can deliver an intense full-body massage that will help to relax your muscles and lower your stress levels. Re-invigorate your body and mind in water temperatures of up to 40°C. Able to heat, massage and filter at the same time, simply choose the temperature of your choice and the thermostatically regulated rapid heating system will do the rest. Inspired by traditional Nordic hot tubs, the Helsinki’s unique exterior uses ultra-rigid Drop Stitch material for long-lasting strength and durability. This coupled with its beautiful realistic wooden design, helps you to embrace the true Nordic lifestyle. The Helsinki also comes complete with a protective spa cover combined with insulating inflatable lid and double-lock securing clips. Taking less than 5 minutes to inflate using the supplied pump heater and hand pump, you can start enjoying the Helsinki in just three simple steps. Inflate, fill and then relax as you lower yourself into your very own hot tub. Putting away or transporting is just as easy. Simply empty and deflate and transport to your new location with no specialist equipment or extra costs required. Safety is paramount and that’s why all Lay-Z-Spa hot tubs include market leading safety measures. Unique to Lay-Z-Spa, the Ground Fault Detection System constantly monitors for a safely earthed power supply. Combined with the improved ultra-sensitive Portable Residual-Current Device (RCD) for secure double-layered protection, you can enter your spa with total peace of mind. The new integrated ChemConnect™ dispenser makes hot tub chemical maintenance easy. Able to be attached to the internal wall of your spa, simply add multifunction chlorine tablets and adjust to determine chemical release. The Helsinki AirJet includes up-to 2 years warranty on the pump and up to 1 year warranty on the liner when you extend your warranty for free, as well as access to our dedicated UK support team as standard. How Easy Is The Helsinki To Set Up? Very easy! The Helsinki only takes around 5 minutes to set up and up to 1-2 hours to fill with water depending on your water pressure. You inflate the Lay-Z-Spa using the pump and you don’t need any tools. How Much Does The Helsinki Cost To Run? We estimate that it costs around *£7 – £10 a week to run the Helsinki based on feedback we have had from our customers (*this is an estimate and does not take into consideration specifics such as electricity supplier and use frequency). Does The Helsinki Have A Warranty & UK Support Team? Yes to both! Our standard warranty for the Helsinki AirJet is 2 years on the pump and 6 months on the cover & liner, which you can extend by 50% for free by registering with us (details in the box). We have a free UK based support team who are fully trained to help Lay-Z-Spa owners. Does The Lay-Z-Spa Helsinki Plug Into A Normal UK Socket? Yes, all Lay-Z-Spas are designed to plug into a standard UK 13amp/240V electrical supply. We advise that you always use an RCD protected socket (like those installed in your home) and not an extension lead. The Helsinki comes with a 7 metre power cable. Yes, it is essential to use chemicals in your Lay-Z-Spa. We have a helpful First Time Hot Tub Owner Guide to Chemicals and we recommend Clearwater Chemicals which are designed with Lay-Z-Spas in mind. Can You Put The Helsinki Indoors? How Long Does The Helsinki Take For The Water To Heat Up When You First Fill It?